Dèesse Magazine: Lash Envy inspired by the Beauty looks off the Runways!!! Lash Envy inspired by the Beauty looks off the Runways!!! 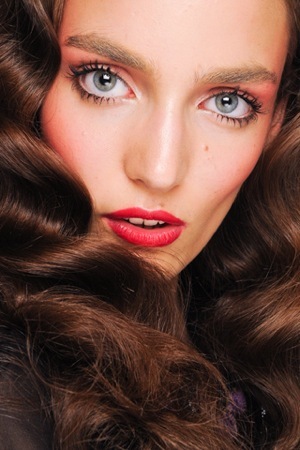 Backstage at this months Anna Sui Spring 2012 RTW show , lashes were the main attraction . All of the models sported perfectly separated, dark long thick lashes which complimented the very pretty beauty look. Unlike the fantasy makeup that usually dominates the runways where overly long false lashes play a role, these lashes were as natural looking as natural can get , and the beauty was like the clothes: Ready to Wear. You too can re-create this look yourself with RapidLash. Eyelash and eyebrow renewal serum, RapidLash, gives women a boost of confidence by helping to restore natural, fuller-looking lashes and brows. Women of any age can benefit from RapidLash but especially those who experience hair loss. RapidLash provides stellar results by delivering essential proteins, vitamins, moisturizing and rejuvenating ingredients that replenish and strengthen the structure of lashes and brows, while adding shine and elasticity. It is safe and effective, and the brand supports the fight against breast cancer by donating 5% of company profits to Breast Cancer Research and The American Cancer Society all year long. Plus, RapidLash is easy to use – with just a quick swipe of RapidLash across the lash line nightly, you will start to see results in just a few weeks. I've been using it on my lashes and brows for over a month, and I've seen the results already. RapidLash is available at mass market merchandisers nationwide for $49.95. How could we forget the lashes backstage at last years Marc Jacobs Spring 2011 RTW Show ... Natural lashes, yet very voluminous and and pronounced. If you want "instant gratification" , Volume Lash: Lash Coating Plumper by d.j.v. beautenizer. I am often asked if I am wearing false lashes when I use this mascara. Volume Lash is a lash coating plumper which seamlessly coats each lash with the thick, 3D film-coating formula. Features finer, uniformly sized particles that contain 2.4 times* the ingredients strengthening the adhesion to lashes for seamless volume with one stroke (*in-house comparison). This quick-dry, budge-proof formula is also fragrance-free and leaves your eyes irritation-free. The unique volume sculpting brush holds a large amount of formula between bristles, which comb through each and every lash for effortless volume and separation. Volume Lash formula contains three conditioning oils to naturally protect and nourish beautiful and healthy lashes. Panthenol, a vitamin B5 derivative for moredefinition, natural silk extract, a silk protein derivative for more resilience, and natural botanical extracts, a moisturizing ingredient to provide nourishment for morelustrous lashes. This wonderful mascara is only 24.00 and is available online at sephora.com and amazon.com. The recipe for amazing fashion-forward lashes is to use RapidLash , and wait for your lashes to grow into perfection - but you should use Volume Lash to "fake it till you make it" with Mega Lashes , and also once your lashes grow for full on DIVA lashes ! !